Very compact. From 12 months onwards. DescriptionVery compact, easy folding highchair. For comfortable and safe meals for baby while staying in Paris. Ultra lightweight and completely portable. Large feeding and play tray. Back rest for baby's head. Need to rent baby gear in Paris for more than 1 month? Contact us for a specific quote. Your little one will always enjoy meal times with the Graco Teatime high chair during your stay in Paris, whether you're staying by friends, in a rented apartment or at the hotel. 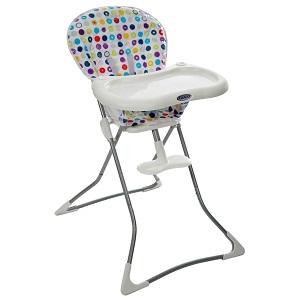 Its very compact design and easy folding system allow you to easily pop the chair up before meal times and pop away afterwards, complete with a washable seat pad you won’t need to worry if any little spills or mistakes happen.